So runs the medieval song. By the time you read this, the first of this summer's cuckoos should have arrived in the Farleighs, their arrival timed to coincide with the start of peak egg-laying time of small birds. 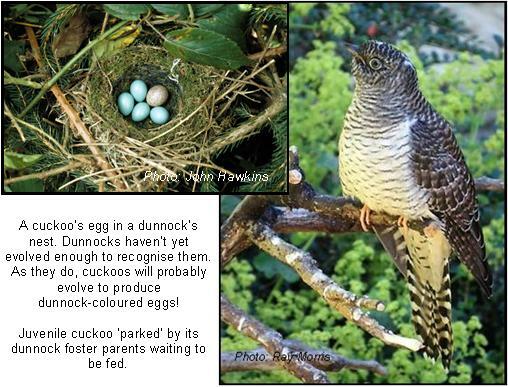 Each female cuckoo is programmed to lay her eggs in the nest of the same species in which she was raised. Those most targeted are reed warbler and meadow pipit. I'm not aware of any local reedbeds for the warblers, although there may possibly be some rough grassland left just big enough for a pair of meadow pipits. However, at the moment we still have plenty of dunnocks (often called hedge sparrows), another favourite host. Many village gardens will have these, so yours could soon have a pair frantically trying to satisfy the hunger of a cuckoo chick. It's happened twice in the last three years in my garden, with the enormous fledgling cuckoo being 'parked' on the garage roof or garden table while its diminutive foster parents forage for insects. A cuckoo's egg laid in a warbler's or pipit's nest looks similar to the host's eggs, but those laid in the dunnock's, or sometimes a robin's, look entirely different. This suggests that cuckoos have only recently evolved to parasitise these two species, and the hosts have not yet evolved to recognise the strange egg and eject it. Interestingly, it was an eighteenth century country doctor who first observed a cuckoo chick ejecting the eggs and young of its host; he wrote a scientific paper about it for The Royal Society in 1778, but some people ridiculed his claim and refused to believe it! Ten years later the same doctor, Edward Jenner, also presented a paper on injecting people with fairly harmless cowpox, to protect them against the deadly smallpox. Some people scoffed at that idea too - I wonder what became of it? 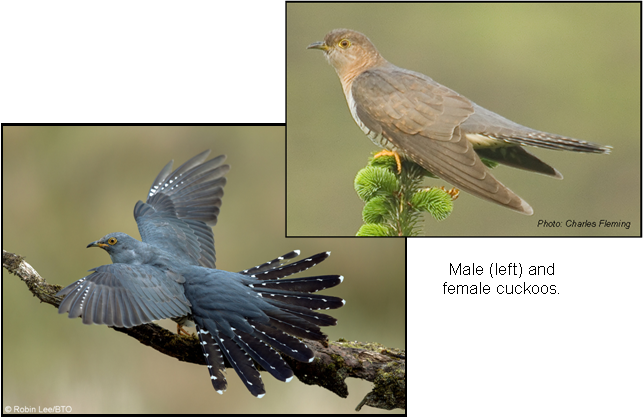 Everyone knows the cuckoo's call, but the familiar one is the male's. The female makes a loud bubbling call after she lays her egg - possibly to celebrate the fact that she has had to sit patiently watching a nest for a day or more to time her egg-laying successfully. It takes her just ten seconds to eject (or swallow - nothing is wasted in nature) one of the host's clutch and lay her own replacement. But cuckoos are in trouble. Their numbers have halved in the last 20 years. Although they are suffering like most birds in the UK from a reduction in their insect prey (their favourite is hairy caterpillars - when did you last see one?) the populations of their main hosts are not declining as fast as the cuckoo's. It seems the main problem affecting them occurs on migration, so scientists at the British Trust for Ornithology (BTO) have been fitting birds with satellite tags to track their journeys to central Africa and back. The study has revealed some fascinating information, not least that climate change and rising human population is implicated. The first of this year's satellite tagged cuckoos to make it back to the UK arrived on April 13th, but as I write this in the last week of April I still haven’t heard one.